A straight smile gets noticed. Period, end of discussion. Anyone who has ever experienced the embarrassment of misaligned teeth can tell you that it just isn’t fun. They tend to hide their smiles instead of showing them off. For obvious reasons, it’s easy to see why most patients hide their smiles – they don’t want anyone else to notice their imperfections. We understand. That’s why we carry one of the best straightening treatments around – Invisalign. It’s the newest teeth-straightening treatment available in the Canton, MI area. When teeth are straight, it can build up confidence in a person. When teeth aren’t straight, it can really bring someone down. We don’t want anyone feeling down and out about their smile. 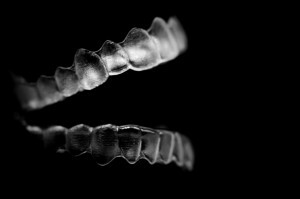 Invisalign can change the way you look and correct misalignment at the same time. Are you ready to transform your smile? Dr. J.D. Robison is the dentist Canton residents can trust. Think about how often someone unknowingly shows their teeth. When they speak, their teeth are on display. When they eat (hopefully with their mouth closed) their teeth show somewhat. Even laughing at a joke can show your teeth off. But, in the case of crooked or misaligned teeth, that same person will probably do everything in their power to keep their lips covering their teeth. Come on…that’s no way to live! A smile is the outward expression of people. A smile is contagious if it’s beautiful. Invisalign can help you get a beautiful smile in less than half the time as traditional braces, and nobody will ever know you’re receiving treatment. Isn’t that neat? As you can see, there are plenty of reasons to choose Invisalign. Unless someone stands way too uncomfortably close to your mouth, nobody will have a clue you’re straightening your teeth. Try doing that with traditional metal braces – you can’t. Our office in Canton, MI welcomes patients from all over the area. We want to get your smile straightened in the least amount of time possible, and that’s where Invisalign helps. If you’re ready to impress your friends, family and co-workers, this is the treatment for you. We invite everyone to try this service, including those of you in Westland, Plymouth, Livonia, Wayne, Garden City and beyond. Are you ready for Invisalign, Canton?